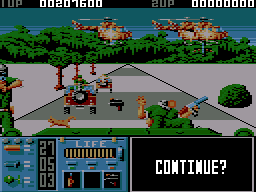 Eight members of an assault team are trapped on an enemy island, and it's your job to rescue them in your armoured helicopter. Some of them are easily found, but the rest are hidden in buildings which you must bomb in order to rescue them. Each one has to be lifted into the helicopter and returned to base, one at a time. Of course, there are enemy tanks, boats, guns and helicopters out there to stop you! The graphics are absolutely excellent and the music and sound effects are good too, but it's the scrolling which slows the game down and spoils things a bit. Watch YouTube videos of this game by: ChinnyVision, The Oliver Twins, Xyphoe. The evil dictator Lee Ho Fook has invaded a neighbouring country. If he is not stopped, he will also take over your country. You are an officer in your country's army, which recently overthrew the previous dictator who ruled it. 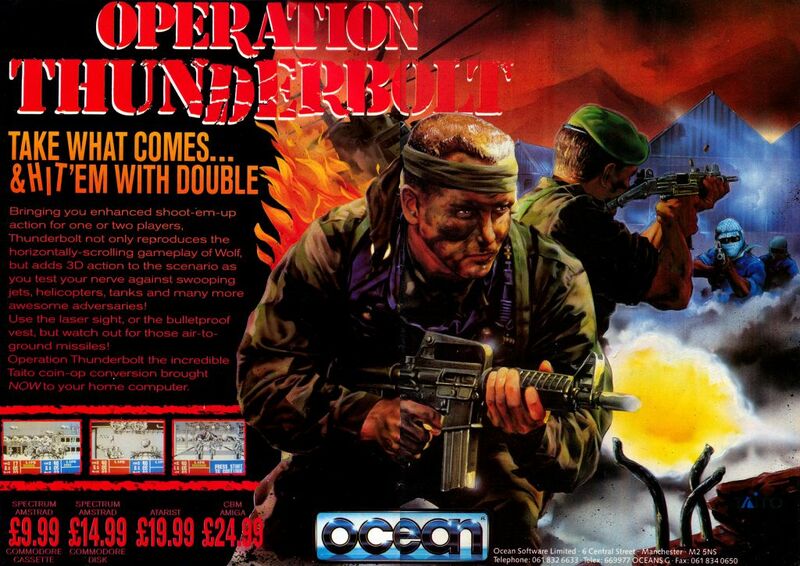 From the moment you see and play this game, you will immediately notice that it has been heavily influenced by Operation Wolf. Both the graphics and gameplay are extremely similar indeed, and this game is almost an exact clone of it. Just shoot everything which appears on the screen while trying to conserve your ammunition! 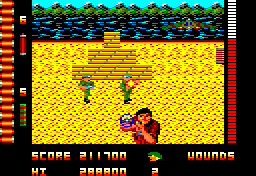 The music on the menu is disappointing, but the graphics are colourful and well drawn and the pace is quite hectic. Even though it's rather easy (if you don't bother shooting the planes), it's still a great game. 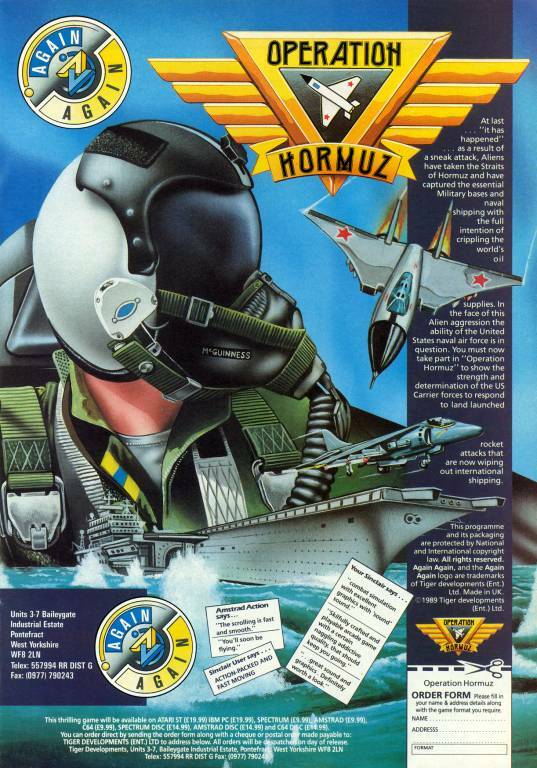 Tension is mounting in the Middle East and several important oil bases are at risk, so the US Naval Air Force have initialized Operation Hormuz – sending you in your fighter jet to take out several enemy missile bases. It would be a tough job in real life, but it's even harder here! As soon as you start, you're bombarded from all sides by enemy fire, and must have the reflexes of Superman to get very far! 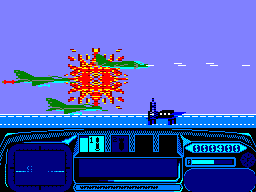 Your jet has four different weapons to take out enemies on the ground, on the sea and in the air. To be honest, it's all a bit too much for my little brain to take in, especially at the speed this game plays at! The graphics are good, and the sound effects are also good (there's an excellent tune on the options screen) but it's basically just Harrier Attack with knobs on. More hostages have been kidnapped, but this time they're being held deep in the African jungle. Firstly, you have to travel to the enemy's ammunition depot before going to the hideout where the hostages are being kept. Next, you must get into your boat and sail to the enemy HQ, where the final confrontation awaits. The game features a novel restarting system, where the number of continues you get depends on how well you're doing, although I'm not sure this is entirely a good thing. 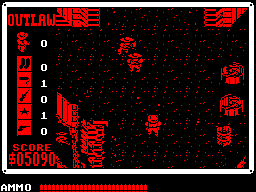 It is a difficult game with more enemies on the screen at once, and worse, you can't see who you're firing at! 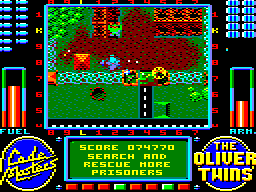 The scrolling isn't very good either, and the graphics on the normal CPC version are horrible at times. A cartridge version of the game is also available. 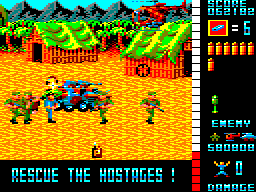 Five hostages are trapped in a concentration camp deep in the jungle, and you must rescue all of them. Your journey starts at the enemy's headquarters, before going into the jungle to the ammunition dump, and then on to the concentration camp where the hostages are then flown out. The screen scrolls horizontally and you just shoot at all the enemy soldiers, helicopters and tanks, but make sure you don't run out of ammo! The graphics are brilliant and there's lots of explosions to be heard, along with a little tune. It's all action and it's an excellent game. Watch YouTube videos of this game by: Metr81, Xyphoe, ZEUSDAZ. A spaceship pilot receives a signal from the spacecraft Orion Prime, but soon realises that the crew has been decimated by an unidentified illness and he must escape a certain death, but not before understanding why this has occurred... With an intriguing storyline that captures the interest of any gamer, Orion Prime quickly puts you into a world of insecurity and questions that desperately seek an answer. The atmosphere of this game is something that can be understood only by playing it. The graphics are amazing, simply state of the art for the CPC. They use all of the available palette, and with precise shadowing, the result is magnificent. The sound is crystal clear and the game itself is huge; there are so many places to explore and the storyline keeps evolving. The grab factor is dangerously addictive. Overall, an experience not to be missed. Watch YouTube videos of this game by: Xyphoe (packaging and gameplay), Xyphoe (walkthrough). Falling asleep at the wheel, you die in a car crash... and you awake in hell. You must now find the way out to the world of the living. Well, it's easier said than done because it's going to be a long road! 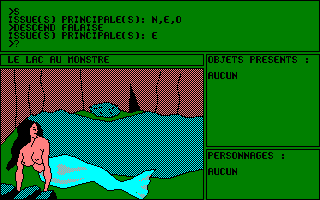 During the first hours, this French adventure game is really addictive. The graphics are good, there are a lot of places to explore and many characters to interact with (this game was only released on disc). As in many other text adventure games, you can only use a few words to progress in your quest. But the problem here is that many essential items are not mentioned when you explore a place, so you can often only rely on the graphics! To make it harder, some actions are a little far-fetched and finding the exact syntax is sometimes really hard. However, if you love long and (very) difficult adventure games, try this one! Race along the waterways of six cities in your speedboat, doing your best to avoid other competitors and crashing into them or the scenery. You must complete six laps of each waterway, and at each end of the course, there are buoys which you must approach slowly in order to turn around. You'll be lucky if you manage to complete two laps, however. The other competitors are very inconsiderate and regularly get in your way, and you always come off worst. While the presentation is astonishingly good (the animated sequences are a particularly nice touch), the game itself could have been so much better. Four outlaws – Butch Moonwalk, Joey the Kid, Scarface Sam, and Mister No Name – are wanted, and as the sheriff, you've got to hunt them down and capture them. 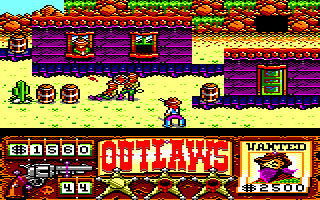 Each of the four levels takes you on a stroll through a particular town, shooting the cowboys that appear in groups from the left and right of the screen, and shooting barrels which may reveal bonus items – or a bomb. It sounds like a reasonable enough game, but it's not. The graphics are terrible (another awful Spectrum port) and while the music on the title screen is OK, the sound effects are useless, and the game is too slow and difficult to be of any interest whatsoever. Daniel Colt has returned to the town of his birth to find it overrun with bandits and outlaws. With his Colt pistol, Daniel must clear each level of outlaws while avoiding their bullets. Your enemies run from one side of the screen to the other, or they can appear from windows, taking aim at you. Certain objects can also be shot, and they may reveal bonuses, such as money or a can of cola (which gives you an extra life). This game won the 2016 #CPCRetroDev Game Creation Contest overall and it also received two additional awards, and deservedly so in my opinion. The graphics are beautiful and very colourful, the music and sound effects are excellent, and the action is fast-paced; you'll need good reflexes to survive! Watch YouTube videos of this game by: jgonza, Metr81, Xyphoe.